“Collect experiences, not things” is an often-cited mantra I definitely agree with. The experiences I often spend money on are music, travel, and consuming good food and microbrews. A recent overnight trip combined all three. It’s a common sight for my husband and I to dance around the kitchen to music by The Mavericks. We know their tunes from the ‘90s but get excited about their newer albums and seeing their live shows. After discovering their tour included a show in Bloomington, Illinois—a community 175 miles away—we scheduled a road trip. I’ve been to Bloomington, Indiana countless times and love it. Was the other Bloomington cool, too? Upon researching things to do in the City of Bloomington and its neighbor, the Town of Normal, (combined to make the catchy name BloNo), I discovered another fun fact. The area is home to the Constitution Trail, 45 miles of trails made possible by a Bloomington, Normal and McLean County joint venture. Much of the trail follows the old Illinois Central Gulf Railroad right-of-way through BloNo, but multiple branches make their way through the community, including a Route 66 branch. 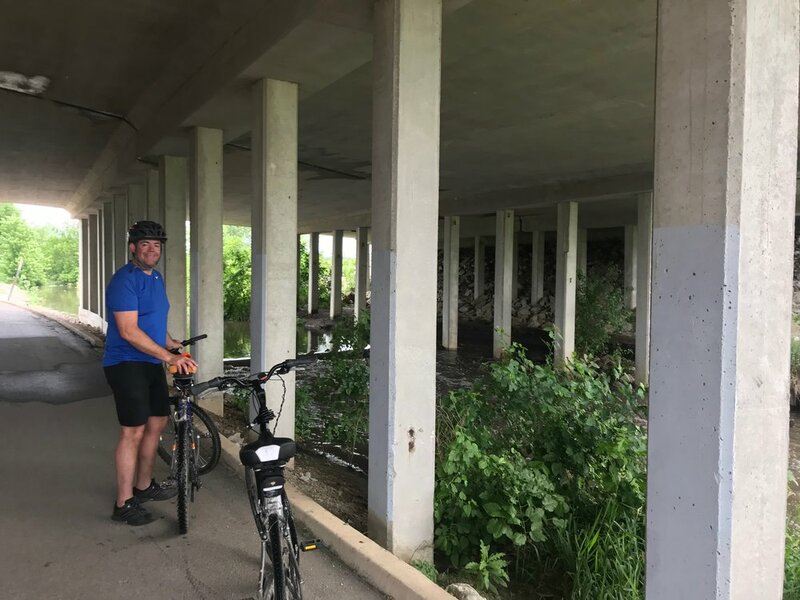 As Indy residents, Jamie and I are fans of the extensive bike system in our city—including the Monon rail trail—so we were eager to explore this community feature. When we arrived in Bloomington, we had some downtime before the concert and decided to hit up some local breweries—places we always enjoy seeking out. One such brewery was Keg Grove Brewing Company. We loved its vibe and its mission. Billed as a “community-centered brewery,” the new brewery donated all of its tips to community organizations during its opening month of June. The night we visited, tips went to the Friends of the Constitution Trail. Talk about serendipity! We had enjoyed a delicious flight (OK, two) and chatted with co-owner Mike before walking to the historic Castle Theatre for an amazing show. The next morning, we awoke to thunderstorms that dissipated just in time for our ride. Having stayed on the south side of Bloomington, we decided to ride the Southtown Branch, then work our way to the north-south Illinois Central branch. Our route required some road riding, but maps show on-road routes. As we hopped on our bikes to start the ride from our hotel, a complication arose. Jamie discovered the cleat had popped off his shoe and was attached to his bike pedal, with no tools available to fix it. He decided to ride anyway. A couple miles in, we saw a hopeful sight: Bloomington Cycle and Fitness, located right off the trail. Their friendly team quickly fixed the pedal problem, and we were on our way. (We stopped by later for delicious drinks from the Coffee Hound Satellite Cafe and other merchandise to show our appreciation). The Constitution Trail offered a lovely ride through a canopy of trees, and many times I felt I was back in Indiana riding a much less-crowded Monon Trail. …and a lovely landscaped area. Wooden bridges provide some fun ups and downs—one over a street and the other over a creek. Reminders of the railroad still remain…. … and signs pay homage. Uptown Normal provides vibrant scenes, including the patio at Emack & Bolio's. We reached the end of the trail, but I wanted to keep going, like the wind turbines in the background. Lunch and brews from Destihl Brewery provided necessary refueling after a bike ride. 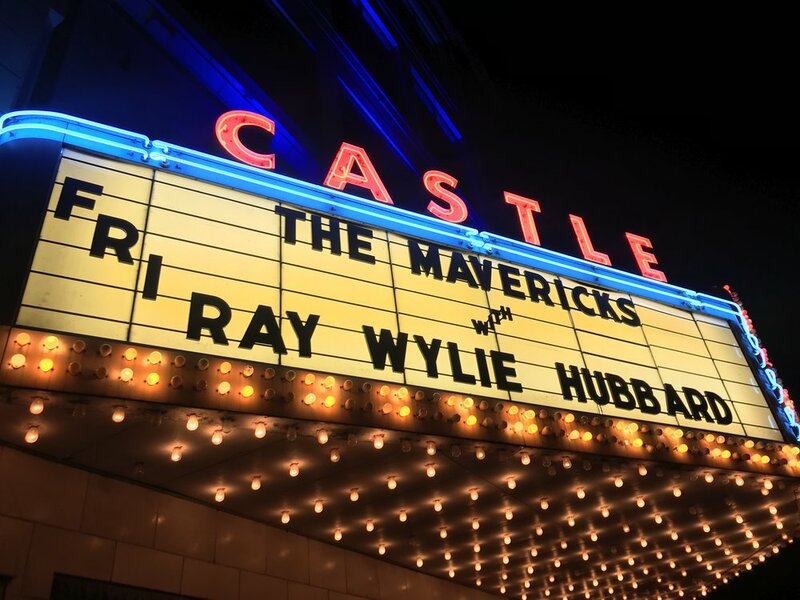 We initially planned our Bloomington trip to see the Mavericks perform but ended up finding so much more. It’s fitting that one of the definitions of a maverick is an independent-minded person. So be a maverick! Hit the road, hit the trail, and start collecting experiences you enjoy. Have you been to Bloomington IL? Any other random road trips that you want to share that gave you more than you would have imagined in an adventure? Comment below! Sign up for our emails to get cool top of mind shiznit from us :)!